Last weekend it was a good bye party. This weekend it is an apartment warming party. Abby and I are calling it a celebration of Love and Health. We've invited all our Parisiene friends and used the opportunity to share and be part of our dream-- notre Reve. "Nous rêvons d'établir un moment sustenable avec l'amours, les amies, la santé et la joie dans la poursuite de nos passions à Paris. On rêve de manifester des lumineux workshops de mandala, un emploi merveilleux ou Abby peux continuer a apprendre la culture francaise, et le relance du 1Mandala project pour le printemps, avec santé et coffres pleines." For myself, I have experienced how powerful it is to write my own drean out publically. I can't wait to find out what happens when you sysnchronize and write an intention out with someone else, wrap it in love, and share it out! It's not everday you can say this: "Today I have moved to Paris!" 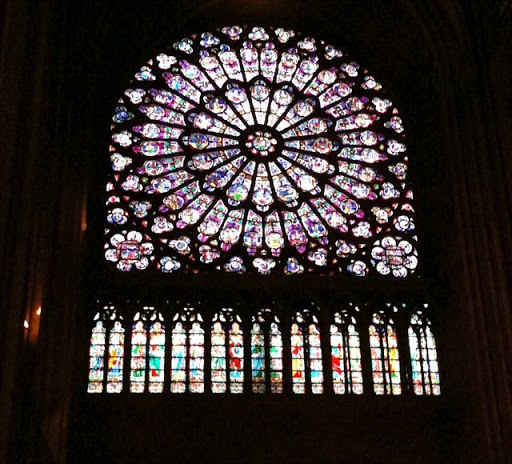 My first Parisienne day began waking up into my dream: My beautiful lover beside me, the bustling Paris streets, and a visit to the Mandala of mandalas: The Rose Window of Notredame! Let the great times begin. I smile big. The anchor is up! My boat is out of the comfortable harbour and into the uncharted seas. I write this on the plane cruising at 35,000 ft to London. I am listening to the same music that I listened to when I set out from Smithers on my bike an epoque ago. a way, it is in fact a much more profound transition. It is a transition seeped in intention and.. first times. You see when I left Smithers, I just jumped on my bike-- I barely had a map! Indeed, I have left home for new countries and new places and new adventures many times now. I have set out on epic voyages, started with new partners, and commenced new projects. However, never quite like this. You see this will be the first time that I return somewhere that I have been before. In the past I have always gone someplace new. It is also the first time that I return to the same project/business after a moment of pause. In the past such a voyage heralded a whole new undertaking. This is also the first time I go to a woman. In the past, I hate to say it, but I have let them come to me, and in this lay an inherent imbalance of commitments-- the lesser course with me. But no, this will be the first time. Most significantly, I know it. And I choose it. And I throw myself into it! This project with my Church community have propelled my healing and my return to Paris. How beautiful to have been able to make my healing in this way. As I write this, I am getting ready to leave for London then Paris tomorrow morning. Completing and posting this movie is just one of many things to harmonious conclude before I go. I am soooo excited, but yet soooo occupied that I don't have space to sustain the excitement. Sooo many details to tie up! Oh... plus I have been working really late each day, and I am exhausted. Over Christmas of 2009 the Church of the Epiphany, in Ottawa, co-created a Mandala of love out of its intergenerational community. Working with artist Russell Maier the community used this ancient artform to celebrate its unity. The mosaic mandala is built with a portrait of each parishioner smiling love to the camera. The final mandala is a visual prayer of the healing and loving togetherness shinning from this family and community. 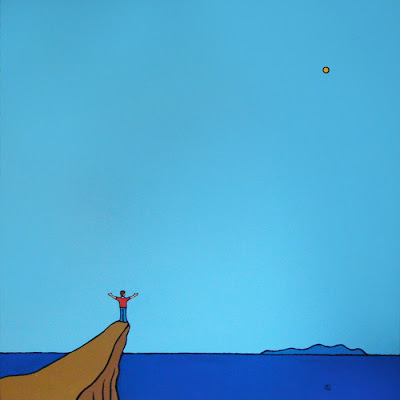 "I sought a way to express the profound blessing of growing up with a rich and varied community. All of us, young and old, families and couples, new borns and elders, single people and married people we are all dancing together in a beautiful moving tapestry of generations and community. This little painting was made on a cigar box over the last month here in Ottawa. I have been apart from my lover and her from I. She has been on my heart, just as I have been on hers. And on both our minds have been on our dream. It is balanced and united in such a way that I couldn't help but think of the Yin and Yang symbol-- which of course has to do with male and female energy. This little creation is a reflection of this. But why a cigar box? About a month ago our neighbour here in Ottawa, introduced me to an old friend of his-- one of Canada's great art collectors. We were invited over to his home for a glass of wine. Claude, the collector, has gotten to know personally many of the great Canadian artists over the last 30 years, ushered us into his apartment. The place was FULL of art! I have never seen such an amazing living room! Bronze scultures, paintings, hangings, iron modern geometric thingies, figures and more. Every table had at least four or five sculptures on it, and every wall as many paintings. On three large walls however, were the cigar boxes. Special shelves had been built to showcase dozens and dozens of them. Thirty years ago, Claude began a crazy idea. He has asked his artist friends to paint cigar boxes for him. It is a brilliant idea, and he has a brilliant collection. He has over two hundred boxes in his collection going back three decades. Immediately when I met him, it was clear that this guy was a true supporter of the arts-- that is, artists. As opposed to some big-wig collector only in it for the investment, all the art scattered through his home had a story about a friend behind it-- artists that he had supported and encouraged in their craft in his galleries and through his collecting. The collection has already been shown as an exhibition in itself. Apparently it goes on display at Canada Museum of Civilizations next year. And, he asked me to do one... and I leapt at the opportunity! The idea of a simple scene came right to mind. As I worked, and with Abby on my mind, this is what evolved. Yesterday, I joined the reverend of my Church here in Ottawa, to lead a mandala workshop at a woman's shelter downtown. We both didn't quite know what to expect. The shelter had recently burned down and the women were staying in a secondary building downtown. It was also Linda's first time visiting in her new capacity as Chaplain. The women however, were super eager to do art. In fact, they all showed up early, and I had to cut my little intro on mandalas in half. They grabed the pencils and got started. In a few moments, with some nice music playing, everyone was captivated in the making of their mandala. Myself and Linda included! We worked on black paper with bright pastels-- a symbol of light coming from the darkness. It also tends to look pretty cool. Most ended up making two mandalas! Afterwards, we went in a circle sharing what we saw in each other's mandalas. Mandalas have an uncanny tendency to be a way for one's soul to speak to oneself. I love it! And so did the women. We all gained new insights through the process. I am looking forward to leading more such workshops. Especially in Paris. Mandala making is a powerful process for self discovery and in this way, healing. 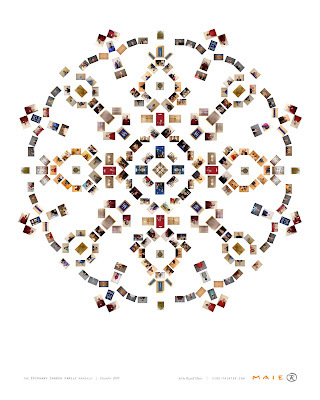 I am also very intrigued with the idea of leading co-created mandalas. I did this back in Smithers with groups of four and two students creating a single mandala together. It is a powerful process of harmoniously working together. To lead couples through this process would be very interesting. That's my mandala up above. It is actually inspired by a little native girl's mandala back at that same school in Smithers. One lady said it looked like the earth. Another like lots of people being activated. The last said she saw love and rebirth in it. Alright! I am really proud to share this one. Here is the final version of the mandala that I have been working on with my old family Church here in Ottawa. We've been working on it together for the last month and a half. Its a co-creation with everybody in my Church-- from young to old, short to tall! The whole community got right into it and I had help from everything from rides, to photography, to smiles. Yes-- smiles. Tht's because everyone in the Church lined up to have their picture taken to contribute to the mandala. Virtually every portrait in the mandala is unique! There are also photos of the various banners and symbols that are scattered throughout the Church. I repeated these to develop the colour scheme. The centre of the mandala is the apex of the Church, where eight beams join to give the building its distinct octogonal geometry. The shades of red are from the gowns of the choir, the blue from the banners, and beige from the walls. Alright! I mention in my last post that I have a lot of creativity brewing... and Creations to share! This little video I completed a week or so ago. Its for my application for a Canada Council Grant. These grants are very prestigious here in Canada and notoriously hard to get. Grants in Canada are hard to get period. There's not nearly as much money for arts as there used to be and in comparison to other G8 and developed countries. This will be my sixth time applying. Normally an artist submits slides of their work. However, there's an option to submit videos also. So, I decide to get a little creative and make all my old slides into a video! I've applied for so many grants, that I have so many old slides. It took off from there. A year ago, I had a stellar opportunity tot pick the mind of a former Canada Council panelist who reviewed applications. My video is designed with his comments and description of the process in mind. I try to tell my story and my project in one succinct three minute blast. I cross my fingers. But whatever. I must now stifle any hope and start focusing other funding opportunities. Its all part of the game. At least, the core work of this video will be very useful for other 1Mandala videos and applications. My creativity is definitely returning. The stove is warming, the water is starting to boil, the pot starting to rattle! Creations are brewing. I have lots of exciting movies, writings and mandalas to post this coming week. But, before I post any fancy-dancy art, I'd like to start simple. With a sentence. A sentence interestingly enough, I didn't create myself. A co-created sentence! Oh... co-creation is so much more fun than solitary creation! I have been discovering this over the last two years, (i.e. 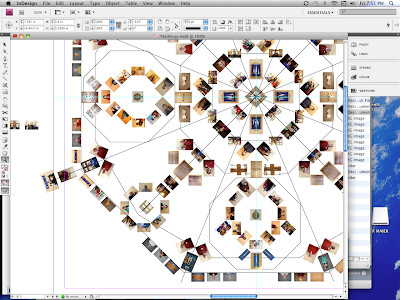 my collaborative mandala projects) and even more so in the last sixth months. Co-creation is especially wonderful when it involves oneself and one's beautiful lover. Before I get to that sentence though, first some reflections on this idea of supra-sexual co-creation. I am feeling there's a lot to this. This is an important idea. Barbara Marx-Hubbard coins the term. She writes that humanity is undergoing a shift in the way that sexual energy creates. For millions of years, sexual attraction has inspired pro-creation. Yet, as humanity hits a point where population is dangerously counter productive to the species and planet, a new way to channel this creativity is evolving. This energy can be harnessed to inspire lovers to new heights of personal discovery, brave new ways of harmonious living and brilliant new humanity-positive creations. The attraction between a couple inspires not only interest in the other, but in the self. The excitement arouses them to discover who they really are and what their personal passions are. 'Vocational arousal' Hubbarb calls it. Genius arousal! The "supra-sexual" creative energy is so strong that it helps the individuals transcend the old generational, cultural, and ideological patterns that have shackled humanity for so long in seperateness and division-- Patterns that would have otherwise hindered them from truelly embracing the call of their hearts, discovering their vocation, their calling, their life's purpose and... following it. Am I a little overly ebulent? Perhaps! Maybe I am just excited to get to Paris and launch back in to following the call of my heart. Or maybe its because in this I too see "a way of transcending many of the premodern, modern, and postmodern notions of what it means to be a man and a woman." Something that points to "...a natural, unpremeditated, and spontaneous expression of a liberated masculinity and a liberated femininity." See the full interview text here. So, back to that sentence! Talking on skype, chatting, brainstorming simultaneously on web based spreadsheets and whiteboards, Abby (in Paris) and I (in Ottawa, planning to go to Paris) brainstormed out our ideas and dreams and passions. We've been apart three months now. Its been lots of time to simmer ideas. Now those ideas are coming to blossom as we co-intend for Paris in the coming months. 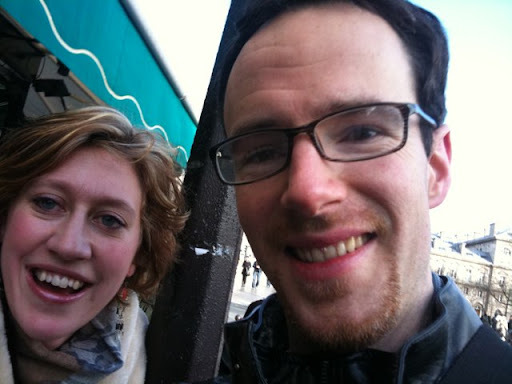 "We dream of a stustainable and joyable and love-filled time together in Paris. We dream of co-creating a prosperous way of doing the things we love and fully enjoying Paris. We dream of being amazing partners so that we can maximize our health, our living, our consciousness, and our gift to the planet." You can also read it on her blog too. How cool is that? We could give a lesson or two to The Secret people on manifesting-- the co-supra sexual way! 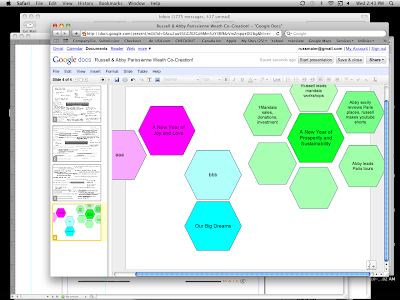 Brain storming and strategic planning on Google Docs. The following is a letter I have literally been working on for the last month. It was sent to my core 1Mandala team, and then to the general team. It is the culmination of two months of long walks, meditation, fasting and well... a long journey. As you know, I have been taking the last few months to reflect on the 1mandala project-- of which you have been invaluable part. It is the moment now to share with you where my heart is pointing. First, I am healing. My energy is stabilizing and rising. I am have come to a place of gratefullness for my stroke. These last two months have been nothing short of the opportunity of a lifetime to be with my family, face generational patterns, reflect and shift and heal. I have had my head down blindly for too long. I have been able to stop, take a deep breath and raise my head. I can not fathom any more powerful way to have gain the insights, the wholeness, and clarity that I now hold. The 1Mandala is just too important and beautiful to abandon. 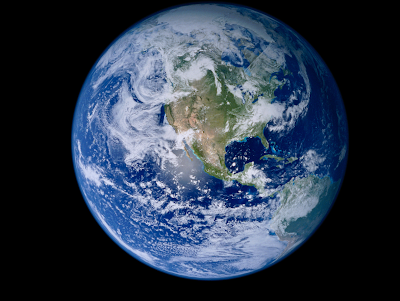 Our planet needs peace, harmony and oneness more than it ever has. The 1Mandala is not only all about oneness, it is this. It is a way for people everywhere to harmoniously co-create something beautiful. That very process is Oneness and is Peace. We’ve seen in each peace portrait how the project resonates with people across borders and cultures. Each of those peace portraits represents a thousand more that long to be made. We are at such a fantastically unique moment for humanity. Not only would it be a shame to retire now, it would a shame to miss the opportunity of a lifetime to do something planetary grand. We are at a moment where there is a great tide of conscious energy that can be taped into like never before in human history. With this energy ideas can be manifested with incredible rapidity. I cannot imagine anything more beautiful to manifest. This is our chance to not only be part of the 2012 shift, but to be part of the push. The planet needs this. We need this. I look in awe at all the synchronicities that have brought me here, that have connected me to you, and that have given me this moment to collect my energy and renew my focus. The most important work has yet to be done. Yet, as I have this clarity, I also know that I am not ready to fully resume. I have major issues to deal with here with my family, finances and health. It is taking much of my energy. And indeed it should-- this is an essential part of my healing. And before I can do anything for anyone else, let alone the planet, that Oneness must integrated in me-- into the artist and leader that can truly manifest the 1Mandala vision. On January 26th, I will be returning to Paris. There I will be with my love Abby. With her at my side, I will continue my healing and steadily organize and relaunch the 1Mandala. For the last 5000 years, humanity has been creating things the male way. I am realizing that part of my healing and the planet’s healing comes by accepting the feminine principle back into its rightful creative place. I am beginning to sense that male and female co-creating in harmony, with Love, is truly powerful stuff. A vision keeps coming back to me: to pull together a harmonious team of twelve men and woman. The team would be focused using Barbara Marx Hubbard’s “Wheel of creation” mandala chart. Each would focus on their area and together we would manifest a charted, sustainable and funded vision. Working through the winter, I envision pulling together this plan, this team, and co-creating a lucid budget to securing the funding to see the project sustainably and harmoniously flourish. All that said, it has been a profoundly great pleasure working and getting to each of you over the last year. I am so grateful. What a journey! I’d like to leave you with a quote that I just got from Playing for Change—musicians who are having fabulous success right this moment doing the musical equivalent of our project. Now, imagine 10,000 peace portrait artists. Yeah. Hockey! Its been such a long time since I played last-- on the ice that is. There's a neighbourhood rink near where I am in Ottawa, in fact, I used to play there with my friends back when I was in highschool. Sick of math and algebra homework, we'd head off for a late night game. I've gone the last few days. There are kids and adults always there hanging around, waiting for the inevitable pick up game. Now, back in the day, I used to play goalie. I also haven't squated in something like five years. But... I am happy to say, I still have the touch! It took me half an hour to warm up, but then I was deaking around, passing and defending against all these teenagers who are definitely on hockey teams! Feels great! FUN. That's gotta be good for healing! What an absolutely spectacular year. What a grand adventure it has been getting to know so many of you all, and well… myself! And now that year has come to a close. Never, ever, could I have imagined it was going to be like this. I have known the heights of love and the collapse of health. I have watched the sun rise on stonehenge and sighed as it set on Tuscany. I have pondered the stars in desolate fields, and have been blinded by the neon in great cities. I have danced holding hands with hundreds and toiled up mountains pedal by pedal alone. Such blessings. With a little reflection, its clear to see that it was not the places, nor the towns and cities, it was the friends and moments shared with them that made it. Almost exactly a year ago, I stood in a 1000 year old Welch Church and was overcome with a singular feeling: I was poised to have one of the most amazing years of my life. Indeed. That night, holding a beautiful hand, thousands and thousands of sparrows coursed across a sky as if to confirm the feeling. I have another feeling. This is going to be one fabulous sequel. As the slow falls softly, but surely here in Ottawa, as my energy and intention coalesce, I feel a year of prosperity, grand love and epic adventure on a planetary scale beckons. I hope to see you on the set!